"In a world where the moral compass of society is faltering, the restored gospel of Jesus Christ never wavers, nor should its stakes and wards, its families, or its individual members. We must not pick and choose which commandments we think are important to keep but acknowledge all of God's commandments. We must stand firm and steadfast, having perfect confidence in the Lord's consistency and perfect trust in His promises. "May we ever be a light on the hill, an example in keeping the commandments, which have never changed and will never change.... May we, in this latter-day war, be a beacon to all the earth and particularly to God's children who are seeking the Lord's blessings." 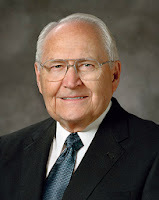 It doesn't take much effort to see evidence of the conflict Elder Perry describes in the world in which we live.